Painted this the other day. Oil on 10″ x 8″ canvas covered board. A lovely spring day albeit still a bit cold out of the sun. This May has been one of the coldest I remember – more like March or April weather. Anyway, “The Pillars of Hercules” Organic Farm Shop and Cafe – the subject of this painting – is a well known local rendezvous where you can get a delicious morning coffee or lunch. Many folks walk from The Falkland Estate through the woods, stop here for a rest and a bite to eat and then walk back. Falkland Estate is a great place to refresh the spirit and “recharge the batteries”. Norma and I once had a delicious plate of “Borsch” (Beetroot Soup) at the Pillars; we’ve been back a few times but have never seen it on the menu since! (P.S. the village of Falkland is one of Fife’s hidden treasures with its ancient Palace, now administered by the National Trust for Scotland, erstwhile home of the Stuart kings, notably James V, father of Mary Queen of Scots, who died at Falkland Palace and on hearing of her birth six days before his death, is reported to have said “”it came wi a lass and it will gang wi a lass”, predicting the demise of the Stuart dynasty). I have tried to capture the freshness of the spring sunshine through the trees which are just beginning to burst into leaf. I feel as if I’m on a journey of rediscovery of my artistic development. A journey that’s challenging yet rewarding. Challenging because I am painfully aware of the distance I still have to travel before I reach the standards of skill that I’m aiming for, and rewarding in so many ways, especially in the rediscovery of the sheer pleasure and satisfaction of working direct from the motif “en Plein Air”. 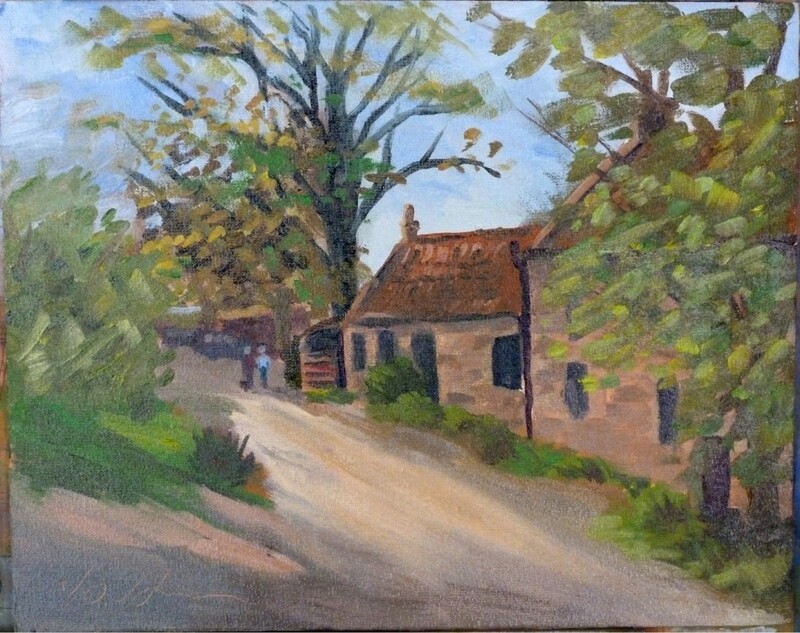 There really is very little to compare with a painting session in a quiet corner of the countryside, interacting with a subject that gets the artistic juices flowing. I feel very privileged to be able to do this even though I still have a long way to go in the development of my technique. and It’s also the name of a pub in london!